If You're not completely satisfied with Your Purchase Simply let us know and we'll offer a Full Refund or Replacement, with no questions asked! 1. Move the switch into AC position, connect the bulb into the AC socket. Turn on or off the AC power to contorl the on and off of the lights. and the light bulb does not work. When the AC power goes off, then the light will be ON automatically with inside battery power. This is DC Emergency Lighting Function. WARRANTY: If You're not completely satisfied with Your Purchase Simply let us know and we'll offer a Full Refund or Replacement, with no questions asked! Movable Lighting Set: built-in high capacity and durable rechargeable battery, can be recharged by solar panel at anywhere and anytime. The light bulb could be taken to areas that aren't wired with electricity. It's a smart solar options for storm, hurricane power off, off grid, hiking, boating, fishing, short backpacking trips, cabin, barn, indoor and outdoor lighting, night light ect. Convenient Design: It could be hanged on anywhere with hook. / 3 levels of Brightness can be adjusted by remote control(effective range: 32.8ft). / Charge your smartphone at emergency condition through "5V DC Output" jack. / Recharged by solar power. Lamp Power Switch Keys: DC for emergency lighting by built-in rechargeable battery, OFF means turn off, AC is used as an ordinary lamp(E27 socket connect AC power E27 base). / Lamp Ports: "6V DC Input" for solar panel charge, "5V DC Output" for charging smartphone or others. 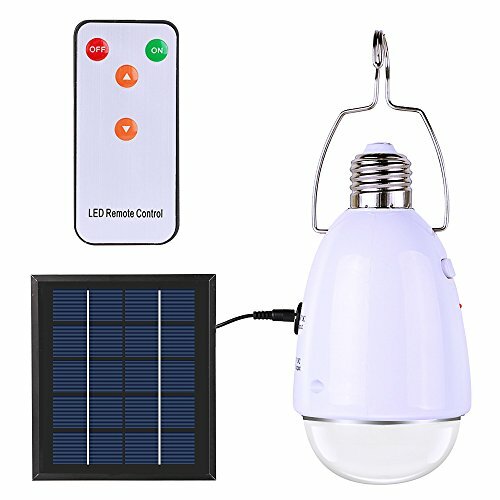 Parameters: E27 Screw Thread; LED Beads: 12 pieces SMD2835; Internal battery: Rechargeable lithium-ion battery, 3.7v, 2000mah; Fully recharged time: About 10 hours; Lighting time: About 9-20 hours; Solar panel: 6V 2W poly-crystalline solar panel with 9.84ft cable.--White LED Solar lamp equivalent to 20W electric incandescent lamp or 10W energy saving lamp. If you have any questions about this product by ELlight, contact us by completing and submitting the form below. If you are looking for a specif part number, please include it with your message.